We wrote this article to help explain and correct some of these common photography misconceptions. For years, camera companies have marketed their products to consumers by primarily touting the number of megapixels. 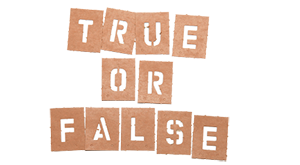 However, megapixels are not a measurement of the quality of the images; the number simply determines the printable size. 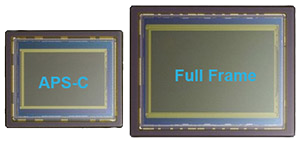 For example, a 3 megapixel camera can print a 5×7, while an 8 megapixel camera can go up to an 8×11 without any post production sharpening. However, any sharp image above 8 megapixels can be enlarged to any size with a little bit of post production preparation. However, the quality of your print is determined by the quality of the image sensor, not the megapixels. Thus you can have a lovely 8×10 print come out of an 8 megapixel camera, while you might have a terrible looking 8×10 print come out of a 15 megapixel camera. So, be sure to look at the quality and type of camera rather than just the megapixels. "...it depends more on the photographer and their technique than the camera itself. There are many amazing professional photographers that shoot with a non Full Frame aka crop sensor camera"
Contrary to common belief, shooting LRAW (Large RAW) vs SRAW (Small RAW) does not provide you higher quality images. The megapixel count simply determines the largest print size when coming straight from the camera. SRAW can be printed directly from the camera at approximately 9 x 13 while LRAW can be printed up to 12 x 18. However, a SRAW image can always be enlarged to print at any size. In addition, virtually every image printed larger than a 8 x 10 will require enlargement touch ups as there can be many flaws in images that aren’t noticable as a 4 x 6, but are as a 12 x 18 print. However, there are several downsides to shooting in LRAW. The first and most important being the decreased low light performance. Shooting in SRAW significantly improves noise handling when shooting in low light situations. Typically, 75% of weddings are shot in what is considered low light situations. Preparation, indoor ceremonies, receptions are all low light environments. Thus, shooting in SRAW will actually provide higher quality images in all of these situations. The other obvious disadvantage to shooting in LRAW is the increased usage of space. This causes the photographer to have to swap out cards twice as much during a shoot, possibly causing him/her to miss moments. In addition, it also slows down post production workflow as well as causes problems when clients try to print from such large file size. Many common labs such as Costco, will not accept files larger than 10 megabytes. Thus there are no downsides to shooting in SRAW and because of the improved noise handling and higher quality low light images we shoot in the SRAW format. While our studio uses Canon cameras and equipment, both Nikon and Canon make great professional camera bodies and lenses. When people ask, which camera is better, there is really no clear cut answer to the question. The fact is, both manufacturers make great cameras overall, with subtle differences. For example, Nikon cameras typically have more autofocus points than Canon. However, the difference is more of a preference than one in quality. While each camera maker takes turns of being on top, in the long run, they are both equal. 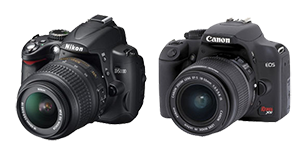 Prior to the release of Nikon’s D3, Canon was on top with the 1D series cameras. Since the release of the D3, Canon was behind until the release of the 5D Mark II. It has always been, and will be this type of environment in the professional photography market. When you ask, ’which camera is better,’ it really simply depends on the month and year you ask. But in general, both camera systems are amazing and professional quality. A few years ago, we might have been able to make the argument that it makes more sense sticking with film, rather than digital. However, today the professional photography scene is much different. While there are still certain situations where film performs more favorably than digital, the overall quality and advantages of digital over film make the choice relatively straight forward. Shooting digital allows professional photographers to have virtually unlimited storage capabilities and thus take more shots (though this is not always a good thing - see our article on quality over quantity). Today, professional photographers can shoot 2,000-3,000 images in a single day using digital where as with film, it was unheard of to exceed 1,000. What does this mean? Well, with more images, you generally will have more choices to select from. Thus the photographer can choose the best of three shots, rather than having to accept whatever shot he had in that moment. Digital also allows the professional photographer to ’chimp,’ or preview, the shot straight in the camera. This allows them to quickly remove any poor shots, as well as to be creative and test their exposures right on the spot. The digital workflow is similar in theory to the film days. Previously, we were developing film in the dark room; today the dark room has simply moved to our computers. However, the techniques of dodging, burning, brightening, levels, etc are largely the same. So, because of the overall quality of digital, the ability to create and test on the spot, improved workflow, and much more, our studio now shoots only digital.